Sun., Sept. 17, 2017, 9:17 p.m.
PULLMAN – If there was ever an offense in the history of civilization that didn’t go through a lull at some point or another, Mike Leach would like to be the first to know about it. He can say with absolute certainty that there isn’t, but before just handing this win over to the Washington State coach, maybe consider a few of history’s greatest offenses. The 2007 New England Patriots averaged 37 points per game, albeit there were a few times – including Super Bowl XLII – that they were held under 20. The 1995-96 Chicago Bulls scored the basketball better than anybody in their era, but hoops historians might point to a cold front during the ‘96 conference semifinals in which they struggled to score 100 in five straight games. The 2017 Los Angeles Dodgers roared into the month of September with 90 wins before going into a deep slumber. And Leach’s Air Raid offense at Washington State? It’s been one of the most dynamic in college football for almost 20 years now, but it’s also prone to a lull every now and again. In that case, for the first few weeks of the season, the Cougars were hitting well below their usual average. They were swinging at the high stuff. They were connecting, sure, but just putting bat on ball isn’t merely enough for an offense that expects to lift a few pitches over the center-field fence every game. If that’s the expectation, then Saturday’s rout of the Beavers was a return to the warm, happy norm for the Cougars. Most teams would still clamor for the kind of “lull” the Cougars found themselves in the first two weeks of the season. They scored 78 points in eight quarters and three overtime periods, they accumulated 966 yards of total offense and they scored eight touchdowns. “Lulls” in Pullman are explosions almost anywhere else. Saturday’s six-touchdown, 591-yard, 52-point outing against Oregon State is what an explosion looks like to the Cougars. The first three steps haven’t been perfect – if we’re judging by appearance, the third one definitely looked the cleanest, and the other two were still a little wobbly – but WSU (3-0, 1-0) still doesn’t sport a loss and the Cougars are three games shy of bowl eligibility midway through the month of September. It isn’t factually inaccurate to call them the top team in the Pac-12 North right now. The Cougars are big betting favorites to run roughshod over their next opponent, Nevada (0-3, 0-0), which is coming off an embarrassing loss to FCS Idaho State. WSU opens minus-28 and Leach might fancy being up that many by halftime so he can give some of his top playmakers a breather before they have to line up against No. 5 USC on a short week. Oregon State didn’t exactly provide much resistance and Nevada’s first three weeks indicate the Wolf Pack may not either, giving Luke Falk and his legion of tall, turbo-charged receivers another opportunity to demonstrate the Air Raid in its purest form. Or the Cougars could put it on the ground nearly every play. “One time, we ran it 40 times or something and everybody thought I spent all this time thinking about the run game,” Leach said. The offense is simply at its best when it takes what the defense offers, then exploits that for all it’s worth. 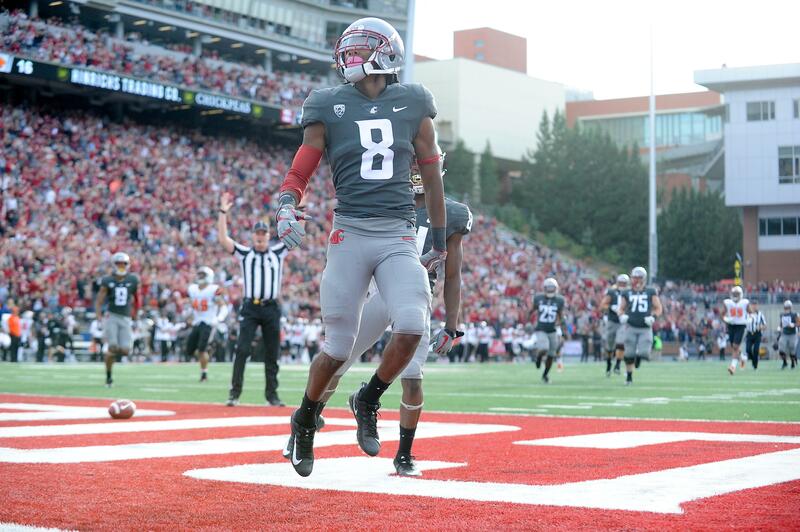 After hitting a few snags, the Cougars went back to that formula on Saturday. Lulls happen. The great teams just don’t let them linger. Published: Sept. 17, 2017, 9:17 p.m.